Starting in the 1920s, covenants in force throughout the region allowed only white people to own property in most neighborhoods in Seattle. The covenants were outlawed in the 1960s, but now a new state law allows property owners to strike them from a property deed. If you own a house in Broadmoor, Capitol Hill, View Ridge, Queen Anne or more than a dozen other Seattle neighborhoods, there’s a good chance that the property deed allows only white people to own the land it sits on. They date back to a time when racial discrimination was explicitly allowed in King County, when restrictive covenants shaped the region’s demographic patterns — a reality that persists to this day. The University of Washington has found examples of more than 20,000 properties here that contain racist covenants. But now, you can fix it — at least on paper. As of Jan. 1, a new law allows you to file a request with the county auditor striking the discriminatory language from your deed. There’s no fee, and no need to hire a lawyer. Covenants restricting ownership by race were ruled unenforceable by the U.S. Supreme Court in 1948, and housing discrimination was made illegal by Congress in 1968 under the Fair Housing Law. Even though the covenants cannot be enforced, they’re often a shock to homeowners who read their deeds or research their house’s history. The Spokane County auditor's office has posted step-by-step instructions on how to modify a document containing racial restrictive covenants; the process is the same no matter what county you live in. You can also click here for a list of all county auditors. What's in your deed? Here's a neighborhood-by-neighborhood guide to restrictions across King County. That’s what happened to Pam Transue’s niece, who moved here from Baltimore with her husband and son. The family was delighted with the house they found in Tacoma. But when they began to sign the closing documents, they discovered covenants that restricted ownership to whites only. Transue’s niece — who didn’t want to be quoted by name — is white, her husband is Japanese-American and their adopted son is Korean-American. Transue took her concerns to Rep. Christine Kilduff, D-Lakewood, who sponsored legislation in 2018 that allows homeowners to file a request with the county auditor to strike the words from the deed. Striking the racist wording is akin to saying “I’m taking a stand against discrimination,” said Kilduff, who was able to get the legislation, SHB 2514, passed on the first try. State auditors and recorders call it a “restrictive covenant modification” document, and it allows a property owner to file a document that legally strikes the void and unenforceable provisions from the deed, although it does not physically erase the words. Restrictive covenants on race were commonly written into deeds across the nation after 1926, the year that the U.S. Supreme Court initially found them to be lawful, said UW history professor James Gregory. A property owner who violated them risked a lawsuit from neighbors, or could have a property sale voided. “It was a very threatening thing,” Gregory said of the restrictive covenants. Gregory, who moved to Seattle in 1993 and directs the UW’s Seattle Civil Rights & Labor History Project, has long been interested in the city’s racial history. Not long after moving here, he came to realize that Seattleites were oblivious of the city’s history of segregating neighborhoods. “Most people, of all ages, seemed to think that civil rights only happened in Selma,” he said. One day in the early 2000s, he went to the King County office where deeds are kept on microfilm, and began to do research by starting with his own home’s property in North Seattle. It only took a half-hour to find what he was looking for: Evidence that ownership of his house was once restricted to whites only. Sometimes the covenants are written into neighborhood association bylaws, sometimes in the deed itself, as with Transue’s niece’s home in Tacoma. Often, however, they are written up separately from the deed, and referenced in the subdivision’s plat documents, or neighborhood maps that show properties plot by plot. When you buy a house, the title company will give you a warranty deed that includes a reference to another document that’s not part of the paperwork; that hidden document is where race restrictions on ownership are often found. “If I’m buying a piece of property, and the covenant says ‘No nonwhite people can live here,’ I would find that incredibly repugnant and offensive, and I wouldn’t want it in any deed of a house I own,” Transue said. 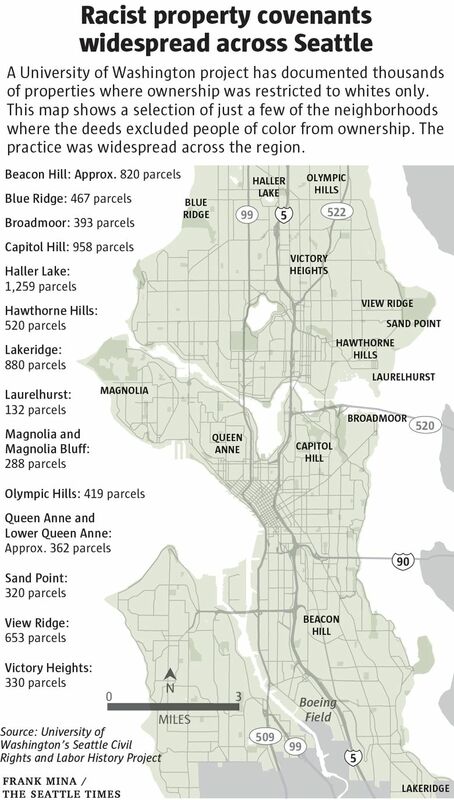 Since 2005, UW students have pored through property records on microfilm, looking for evidence of restrictive covenants, and finding them everywhere: Capitol Hill, Madison Park, Queen Anne, Magnolia, Blue Ridge, Olympic Hills, Laurelhurst — almost all of the Seattle neighborhoods north of the Ship Canal. They were also widespread in Seattle’s suburbs. Blue Ridge resident Doug Dunham says he collected 500 signatures from the property owners in his neighborhood in 1989 to amend the racial clause out of the community’s covenant. The project took him about a year. “I wish we had had that procedure decades earlier,” he said of the new law. After the UW project began, a woman who lived in a Clyde Hill subdivision found that the deed to her property, written in 1947, restricted ownership to “Aryans only.” That restriction was written two years after Hitler’s death during World War II, and after the horrors of the Holocaust had become known, Gregory said. “But the covenants themselves, the act of writing them, was an indication that enforced segregation was entirely legal and was in the interest of the public,” he said. In the late 1800s and early 1900s, Asian Americans were the first victims of segregation in Seattle. In 1927, the National Association of Realtors met here and spread the idea of race-restrictive covenants among local realtors and developers; that same year, the Capitol Hill Community Club retroactively started a campaign to make that neighborhood of older homes restricted to whites only, Gregory said. By 1960, “nearly all Black, Asian, and Native American families were locked in a triangle of census tracts in the Central District and Chinatown,” according to the The Civil Rights & Labor History Project. Twenty years later, census data shows, Seattle neighborhoods north of the Ship Canal, West Seattle, the Eastside and South King County remained virtually all white. 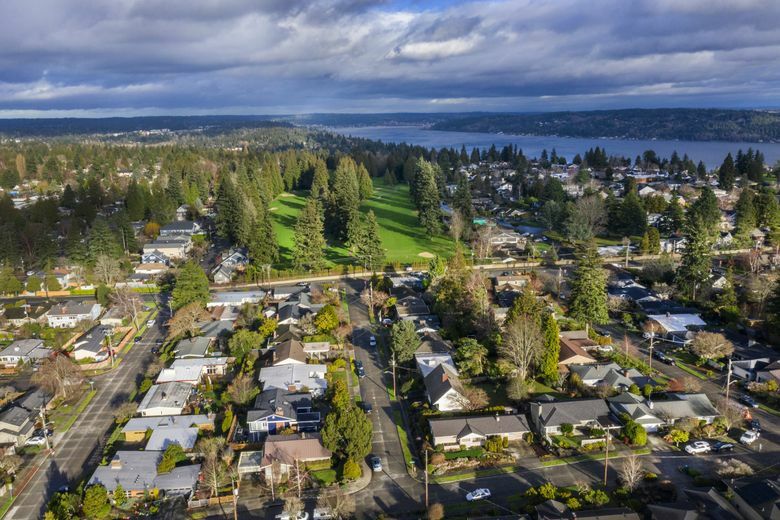 Even as late as 1941, an exclusive subdivision that opened north of Seattle called Innis Arden — subdivided by William Boeing, founder of Boeing Aircraft — included restrictive covenants in its homeowners association rules that prohibited the sale or lease of the homes to anyone who wasn’t white. In early 2006, the state Legislature passed a law urging homeowners associations to expunge racist restrictions, and later that year, the Innis Arden association deleted the offensive paragraphs. That was one step. But most restrictive covenants are attached to individual properties not governed by homeowners’ associations, Gregory said. The covenants can’t ever be completely removed, because they are part of the property record. The legislation “simply gives the property owner the power and right to add, essentially, a statement that declares that this is obnoxious and null and void,” Gregory said.